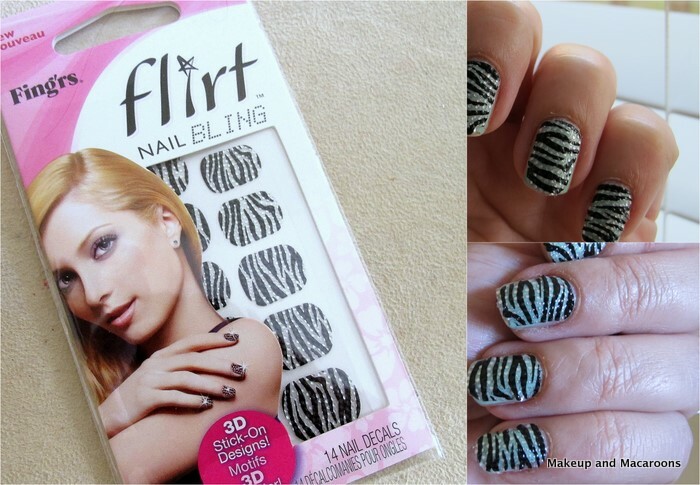 What do you think of my zebra nails? I'm not sure they're really me. While I admire nail art on others, I prefer sticking to my usual pinks and corals and reds. And mint... I love mint green polish. These were actually nail stickers, Fing'rs Flirt Nail Bling, which were sent to me a while back for review. I've seen them sold at Priceline with prices ranging from $9.99 - $13.99. They were very easy to apply. Just peel them off the sheet and place the sticky side over the nails. You are meant to apply clear top coat over them, but I was feeling lazy so I didn't. I applied them on Saturday over my already painted nails (with Essie Mint Candy Apple) but by lunch time Sunday they were starting to peel off. If you look at the above pics carefully you can see they're starting to peel off... they were taken on day 2. I don't know how long these are meant to last, but I didn't mind as I wasn't exactly planning on wearing zebra nails to work anyway. It's not something I'd buy, but it's a good way of experimenting with nail bling quickly and without hassle. How do you feel about nail art? Yay or nay? It kinda grew on me after a while, but it's not something I'd attempted to actually paint on. Agreed, they're good for quickly blinging up the nails. I love the design! Looks so pretty on your nails :) I haven't tried nail art stickers yet, but I want to pick up the Sally Hansen ones that everyone raves about. Give them a try, they're surprisingly easy to apply and lots of designs to choose from. Aaw thank you, my husband did well with that one! Oops, thanks! I DID mean Nicki... all corrected now. For nail art this isn't too bad and OTT so I don't mind, but yep like you I'm not into ones with too much happening on them.